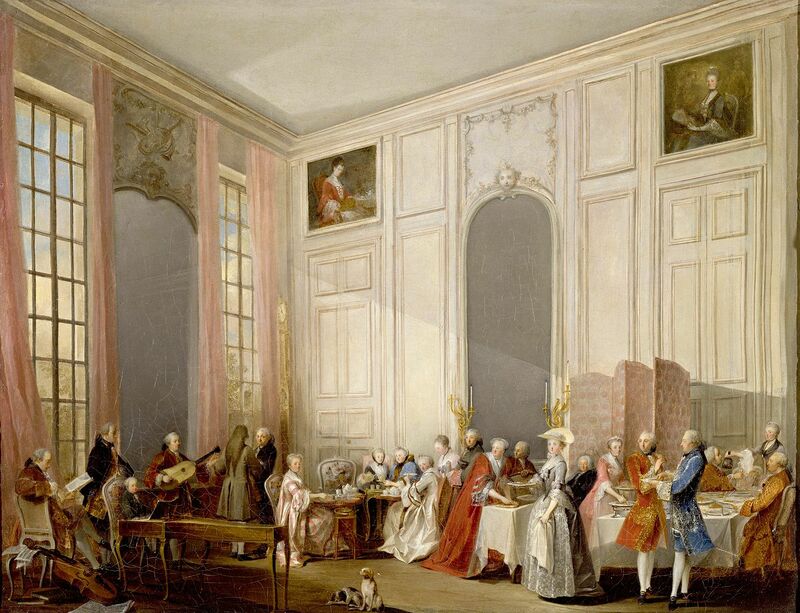 Le Thé à l’anglaise servi dans le salon des Quatre-Glaces au palais du Temple à Paris en 1764, Michel Barthélemy Ollivier, 1766. We have previously written about the debates over the political relevance of the Enlightenment today, drawing on Antoine Lilti’s critical review of the histories of Jonathan Israel. We present the English translation of his essay, which has import far beyond any disciplinary boundaries. This might be true, but which Enlightenment? On this point, there is little agreement among historians concerning the multiplicity of approaches, and existing works seem to discourage an overarching framework. At a time when grand narratives have fallen out fashion, one cannot help but be struck by the gap between, on the one hand, the proliferation of historiographical studies which offer a fragmented landscape, and on the other hand, the essayist discourse striving to actualize the Enlightenment amidst contemporary debates. This situation might seem discouraging; Jonathan Israel has not been discouraged. In a massive work, two volumes of which have already appeared, with a third having been announced, he proposes a broad reinterpretation of the Enlightenment based on the notion, borrowed from Margaret Jacob, of the “Radical Enlightenment,” and a re-evaluation of the impact of Spinoza’s thought, which he deems to be essential. 2 The monumental scope of this enterprise, as well as its significant and largely favorable, even enthusiastic, reception, makes this an indispensable work. Both an encyclopedic synthesis and an engaged piece of writing, Israel’s work marks an unquestionable intervention in Enlightenment historiography – all the more since this solitary work is not isolated, but rather indicates and renders more visible an ensemble of works that aim to rethink the subversive energy and charge of the Enlightenment. Even the recent currency of the term “Radical Enlightenment” largely seems to signal a change in orientation, if not paradigm. While twenty years ago, the influence of Jurgen Habermas’s works had solidified a neo-Kantian interpretation of the Enlightenment, articulated through the critical paradigm and study of the public sphere, the works on this clandestine philosophy and the Radical Enlightenment would seem to herald a new interpretative framework, which features Spinozism both as the matrix of the Enlightenment and as a resource for contemporary social science. Still, this label raises as many questions as it answers. First of all, we can say that even while recognizing the contributions of Israel’s work, I will focus here on the questions that his interpretation elicits, as well as attempt to discern the limits of his enterprise. This will be less a matter of discussing his analyses point-by-point, than a reflection on the tools utilized by the author and the concepts at work: what is Spinozism? In what way can the Enlightenment be called radical? How do we conjoin or combine the history of philosophy with the cultural history of intellectual productions? Is Europe important as a dimension? The core of the discussion will bear upon the equivalence Israel establishes between a classic category in the history of philosophy – Spinozism – and a historiographical category – the Radical Enlightenment. This will enable us to formulate several alternative paths for approaching the radicality of the Enlightenment and its relation to modernity, a particularly tangled term but important for Israel. In this sense, our discussion will be essentially historiographic: it invites us to inquire, more broadly, as to the way in which the history of the philosophy of the Enlightenment is and can be written today. In this voluminous, prolific, and at times repetitive work, one thesis – powerfully presented – very clearly emerges: Spinozism had a considerable influence throughout Europe from the end of the 17th century, but mainly because of censorship, it was often expressed in a clandestine manner, to such an extent that historians have consistently underestimated or downplayed it, rather showcasing the more moderate, liberal, empiricist, and deist authors, around which the intellectual history of the Enlightenment has been written. From this perspective, Israel’s aim is clear: to present a new general interpretation of the Enlightenment that emphasizes its radical, materialist, and democratic current, and identifies in it the true locus of Western modernity, instead of and in place of the moderate reformism of Voltaire, Wolff, or Locke. Israel does not hide his priorities in the slightest: the Radical Enlightenment holds all of his sympathy, and must be studied, rehabilitated, and defended. This is the heritage we must reclaim and recover. 5 The “moderate” Enlightenment, on the other hand, only inspires his barely concealed contempt: far from being an emancipatory force, it was often allied with conservative reaction, or in the best case scenario, forces of compromise. 6 Whatever one’s judgment or opinion on this thesis, these two volumes’ appeal would be not be doubted, if only for the sum of knowledges that it gathers together and makes available. Israel’s considerable erudition, his mastery of several European languages, and his capacity to reread and cite an impressive number of forgotten texts all have been commended by several reviewers; the success of this book is for good reason, as it presents itself in all respects as an encyclopedic summation or synthesis. But its seductive power lies elsewhere; it is both a historiographical and political narrative. In the first instance, Israel’s art is to propose a grand narrative, centered around the spread or dissemination of Spinozism, in a manner that 18th century historiography has not produced for a long time. This aspect of the book does only apply or refer its ability to order a large number erudite or esoteric monographs within a wider tapestry, but also to the specifically narrative dimension of the book, since the major currents of the Enlightenment that the author identifies (Spinozist radicalism, but also the moderate Enlightenment and the Counter-Enlightenment) confront each other, align with each other, and then clash again through the entire period, in a sort of “triangular battle of ideas.” 7 As we will see, this narrative dimension follows from a political reading of the intellectual field, whose cost is often a simplification of intellectual genealogies. The seductive power of the book is tied to three major displacements undertaken in regards to Enlightenment historiography. First, a thematic displacement, since revolutionary and materialist radicalism occupies the primary level here, at the expense of more classic and more accepted [consensuelles], figures in the Enlightenment pantheon, which would be nothing more than a result of a compromise with authorities, or even a reaction against such audacity. Next, a chronological displacement, with Israel locating the beginnings of the Enlightenment in the 1660s, in advance or ahead of the “crisis of the European mind” important for Paul Hazard or the pre-Enlightenment (Frühaufklärung). While the boldest commentators usually locate the intellectual tipping point in Europe around the 1680s, with the works of John Locke and Pierre Bayle, the Revocation of the Edict of Nantes, and the Glorious Revolution, Israel sees the essentials of the Enlightenment playing out earlier, in the 1660s-1670s, when Spinoza’s work was developed, written, and published. 8 Moreover, he argues that at a philosophical level, everything had been said by the beginning of the 18th century, with authors like Voltaire, Hume, or Montesquieu only contributing “minor additions” to the intellectual developments of the previous period. Through measured provocation, he affirms that “even before Voltaire came to be widely known, in the 1740s, the real business was already over.” 9 Lastly, a geographical displacement, since the Dutch Enlightenment plays both a preliminary and leading role here, which Enlightenment historiography has not adjusted to. As a preeminent specialist of the history of the Dutch Golden Age, Israel is right in his element, and draws upon the renewed interest in the study of 17th century Dutch radical thought in order to reinsert Spinoza within this intellectual culture. 10 On the other hand, the British world – whether John Locke’s England or David Hume’s Scotland – is for the most part excluded from this landscape, which is also surprising. The specificity of the French reception of Israel’s work has not been limited to this militant encounter with the neo-Spinozists. While the book has been extensively commented upon by historians of the Enlightenment in England, the Netherlands, Italy, and the United States, in France it has been discussed not so much by historians than by historians of philosophy. 14 Here one can doubtless see the typical suspicion of French historiography towards the history of ideas. This situation is untenable, and the debate regarding how intellectual history can be relocated within the history of the Enlightenment should be articulated. Before coming to this, we must first see what kind of intellectual history Israel understands himself as practicing. One might expect that an overview of Spinozism in Enlightenment-era Europe, sketched by a historian breaking with the methodology of social and economic history and a pre-eminent specialist on the Jewish diaspora and commercial networks in modern Europe, would be the occasion for a dialogue between intellectual history sociocultural approaches. 15 The opening chapters devoted to the social and political context attest to this hope, which is quickly disappointed when it becomes clear that the author wishes to situate himself in the framework of the history of ideas in the manner of Paul Hazard and Peter Gay, who are, moreover, two models considered: the former for the attention given to the turn of the century and the crisis of the European mind, the latter for the ambition to offer a global history of the Enlightenment. 16 The paths of these authors are often detailed, the controversies, even minor ones, are related in rich detail, the strategies and conditions of publication are often evoked. In particular, the chapters concerning the progressive publication of Spinoza’s works are well documented and several commentaries on Spinozistic novels offer a precious, though rare opening out of the properly philosophical corpus (RE, 591-8). Nevertheless, the argument is situated exclusively at the level of texts and their interpretation: what is the thought of this or that author, what did he mean to say, which author influenced him the most, what current was he situated in? The reception of the works and their appropriations are largely ignored, without mentioning the social and cultural practices which have been the object of so many efforts these past few decades. Thus Freemasonry itself is swept away with the back of the hand. While certain Masonic lodges or libertine circles played an essential role in the genesis of the radical enlightenment described by Margaret Jacob, permitting the circulation of English ideas in the Netherlands and serving as the crucible where different heritages merged, it is here voluntarily excluded from the landscape by way of peremptory formulas: “If our aim is to get to the heart of the Enlightenment as a decisively important world-historical phenomenon, arguably the less said about Freemasonry the better” (EC, 865). The ensemble is thus presented in a fashion that is extremely classical, even a little obsolete, in which the authors and their works are reviewed one after the other, in order to evaluate their degree of adhesion to Spinozism. Enlightenment Contested goes particularly far in this direction. On the one hand, the thematic construction of the book gives it the allure of an immense collage of commentaries on texts. On the other hand, a virulent introduction explicitly demands the motor role of ideas in social or political transformations and invites, on its example, the refounding of historical studies around a new intellectual history which looks very much like an old history of ideas. To do this, Israel presents a fairly personal reading of the debates of the last decades, presented as opposing three currents which followed the old, discredited history of ideas: the Cambridge school around the propositions of Quentin Skinner, the history of concepts animated by Reinhart Koselleck, and the history of mentalities or “diffusionist” represented here by Robert Darnton and Roger Chartier. It is on the latter, presented in a perfectly caricatured fashion, that he concentrates his attacks, reproaching it for a structuralist and materialist approach, neglecting the role of ideas in favor of social and cultural transformations so vague as to be indemonstrable (EC, 15-26). 17 In reaction, Israel proposes to practice a new intellectual history which will put back at the heart of historical explanation the coherence of philosophical systems and the role of ideas. The historiographical stakes are very clearly attached: it is a matter of returning to an explanation of the French Revolution by its intellectual origins, that is to say, by the ideological shock that was represented by Spinozist radicalism and its avatars. “Socially and institutionally, ancien régime society did not change very dramatically between 1650 and 1789. What did change spectacularly and fundamentally was precisely the intellectual context; and so this is what chiefly needs explaining” (EC, 5). This double refusal – one, explicitly, of the part played by the social history of culture, and the other, implicitly, of an intellectual history which would not be only a history of ideas – weakens the demonstration. Israel, in effect, continuously interlaces two motifs. The first corresponds to a historical argument, according to which the radical, Spinozist current of the Enlightenment was the most influential in the 18th century. 20 But the defense of this argument implies being much more attentive to the circulation and appropriation of the works it evokes, not to mention the appearance of Spinozist motifs in ordinary irreligious discourses. Now, at times Israel studies works which were never published under the Ancien Régime to any great extent, and which sometimes were not even circulated as manuscripts. 21 Exhuming some texts, including a radical critique of religion, certainly demonstrates that from the end of the 17th century a current of thought existed which was radically hostile to revealed religion, but who seriously doubts this? On the other hand, if these texts remained unknown until the erudite research of the the past few years, can we seriously accept that they were more important than the works of Leibniz, Voltaire, Locke, Hume, or Montesquieu, and that they powerfully contributed to preparing the French Revolution? It is clearly the articulation of these two theses, sometimes distinguished but often conflated, which makes the book interesting and which is also the source of all its fragility. It is therefore necessary, to wade now into the heart of the discussion, to interrogate the essential points of this architecture: the place of Spinozism at the center of the Enlightenment and the definition of what is a radical philosophical statement. Israel’s argument is less novel than he claims. It is a bit audacious to claim that the influence of Spinoza has been entirely underestimated. In reality, numerous works have been devoted to the development of Spinozism in the Netherlands, as well as its repercussions in Europe, starting with Paul Vernière’s important book on the reception of Spinoza in France before the Revolution. 23 It is true that Vernière, in contrast with Israel, interpreted this reception on the model of a productive misunderstanding, considering that the important presence of references to Spinoza are drawn from partial and falsified readings. But it remains the case that Vernière’s work was fundamental in precisely and patiently tracking the place Spinoza occupied in the intellectual debates of the Enlightenment and in identifying the principal intermediaries which assured it success. As for the idea of an intellectual revolution produced by Spinoza in the domain of religious disbelief, it is not new and was defended notably by Silvia Berti, who argues that the author of the Ethics introduced a caesura in the history of irreligion by providing it the intellectual instruments of a rigorous atheism, distinct from the diverse forms of skepticism. 24 The term Radical Enlightenment is itself borrowed from Margaret Jacob, who had already argued for the rediscovery of these currents of thought, and focused above all, for her part, on the Anglo-Dutch conjuncture of the years 1690–1720, the consequences of the Scientific Revolution and English neo-republicanism, the pantheism of John Toland, and the Masonic lodges of The Hague. More generally, the abundant bibliography which Israel leans on testifies fairly eloquently to the efforts which preceded him. He nevertheless deserves the merit of having provided a strong argument: that of an intellectual hegemony of Spinozism at the core of the Radical Enlightenment. Both the methods and conclusions of this argument warrant discussion. The tracing of Spinozism is even more striking when Israel talks about what one might call the heart of the Radical Enlightenment: the heterodox philosophical literature circulating in the form of clandestine manuscripts, at the end of the 17th and beginning of the 18th centuries. The interest in these authors and these texts is long-standing, and goes back, in France, at least to Gustave Lanson, then to Ira Wade. 28 But these efforts have proliferated in France, Italy, Germany, and even Spain, especially since the 1980s, to the point of constituting a dynamic sector of research, generating critical editions, colloquia, collective writings, and even prompting a journal. An impressive number of authors were exhumed, their manuscripts found, their sources examined. 29 It is henceforth well established that the years 1660–1750 were the golden age of the clandestine philosophical manuscript, becoming a veritable weapon of philosophical communication. Israel makes good use [faire son miel] of all these erudite works, proposing a comprehensive vision of very specialized studies [recherches], sometimes getting a bit bogged down in the disputes of attribution and patient identification of sources. To do this, he has a key of reading that opens all doors: Spinoza. It allows him to remove these works from the circle of specialists to cast [fondre] them into a story where the influence of the Spinozan revolution can be felt on every page. But where the majority of the research has highlighted the complexity of this literature, nourished by multiple references and sometimes only with difficulty compatible with a strictly philosophical level, Israel wants only to see the beautiful order of Spinozism in motion: “the central thrust, the main bloc of radical ideas, stems predominantly from the Dutch radical milieu, the world of Spinoza and Spinozism” (RE, 694). The stakes are crucial: the philosophical pluralism of Radical Enlightenment. One of the great lessons of the works produced over the past few decades is first of all the theoretical eclecticism of this clandestine philosophy. The heterodox thought of the pre-Enlightenment, far from being reducible to a derivation of Spinozism, is nourished by a considerable diversity of sources, a simultaneous encounter and combination of Hobbes, the skeptical tradition (sometimes radicalized in the direction of disbelief), 30 different currents of Protestantism (such as Socinianism), but also the work of libertines like Giulio Cesare Vanini, François La Mothe Le Vayer, Gabriel Naudé, whose importance and impact have been significantly reevaluated, and finally Spinoza. Thus, if Toland, the great figure of English deism, owes everything to his reading of Spinoza in Israel’s view, other historians of philosophy consider, on the contrary, that his materialism, which will profoundly irrigate the 18th century, owes as much to the refutation of Spinoza, through contact with Leibniz or the new sciences of nature, as to Spinoza himself. 31 In the same way, the materialist conceptions of man, refusing the idea of an immortal soul, derive often in England from theological debates within Protestantism itself, and without any link to Spinozism, but often dependent on innovations in medical thought. 32 In Germany, the influence of Spinoza’s work on the authors of the Frühaufklärung is undeniable, but it is no doubt less vibrant than that of the currents emerging from the Reformation, particularly the anti-trinitarian currents. 33 Even in Holland, the radical authors of the end of the 17th century are far from presenting a homogeneous profile. Israel shows well, in an interesting and original chapter, the intense circulation of themes and pronouncements issued from the work of Spinoza in works like the Philopater, a bildungsroman published in 1691 and 1697, or in certain polemical texts (RE, 295-327). But why systematically qualify their authors as “Spinozists,” which assumes either the coherence of an intellectual filiation, or the claim of belonging to a school, when this is really a matter of hybrid texts, whose value and interest are precisely their intellectual hybridity, often forged in the urgency of polemic? Consideration of the ways in which these clandestine manuscripts put into play original thoughts, which do not necessarily return to the major categories of the history of philosophy and work often at the heart of religious traditions themselves, would allow us to do justice to the inventiveness of heterodox thought. The most striking case is doubtless the famous Treatise of the Three Imposters, also known as The Spirit of Spinoza, which was the most widely disseminated clandestine manuscript in Europe in the first half of the 18th century. Its history is particularly complex and remains full of mysteries despite the recent work which has established the major points. 34 A first version of the text was definitely written at the end of the 1670s, in all likelihood by Jean-Maximilien Lucas, author of an important Life of Spinoza; it already combined, around Spinozist citations, a diversity of libertine and Hobbesian references. The text was then revised at the beginning of the 1710s by several authors, Charles Levier, Jean Aymon and Jean Rousset de Missy, from the Huguenot community of The Hague and members of a libertine association, the Knights of Jubilation, linked to the milieus of booksellers and in which it is possible to see a proto-Masonry. 35 When received to great success, it was again modified for an edition published in 1719, but whose diffusion remained marginal. What is essential is that this manuscript played an important role in the spread of Spinozist themes, and even more so in the identification of Spinoza with a radical critique of religion, but that it is in reality a text woven together of motifs coming from different heterodox traditions. Alongside the developments inspired by the Ethics and the Theological-Political Treatise, we find here numerous Hobbesian themes, notably the explanation of religions by fear, or libertine themes, like the argument about the political deception of religions. The Treatise of the Three Imposters is therefore in no sense a coherent synthesis of Spinoza’s thought, but really a collage of arguments and citations from different philosophical traditions, and where the extracts of Spinoza rub shoulders with those of Charron, Vanini, Naudé, La Mothe Le Vayer and Hobbes. 36 Now, while recognizing this diversity of sources and the fact that, after the opening chapters, the text “no longer draws directly on Spinoza,” Israel concludes that the manuscript is of an essentially Spinozist orientation and sees in it an illustration of this “fundamental historical reality” which is, in his eyes, the Spinozist matrix of the Radical Enlightenment (RE 697, 694). But such a reductive interpretation of the Treatise, contested by numerous specialists, is not based on any precise analysis of the text and, given the importance of the stakes, one can only be surprised by the casualness with which the author proclaims its Spinozist coherence. In reality, it is this whole approach to clandestine philosophical manuscripts which is marked by a circular reasoning: because he has identified the Radical Enlightenment with the influence of Spinoza, Israel only seriously considers the texts which belong to this category and considers others to be marginal. Thus, when he insists on the fact that the Treatise of the Three Imposters was, by far, the most widely disseminated of the clandestine manuscripts, he remarks that another manuscript was at the same level and had the same geographic area of diffusion: Bodin’s Colloquium Heptaplomeres, but he dismisses this from the study under the pretext that, written a century earlier, it bore the marks of belief in “supernatural forces such as demons and witches,” which the “esprit forts of 1700s must have regarded as thoroughly antiquated and absurd indications” (RE, 695). But in this case, how to explain its success? Logically, it would be necessary to conclude either that doctrinal coherence was not so strong in the radical milieus, or that the diffusion of manuscripts is not a good indicator of their importance and their intellectual influence. 38 It is then a social and cultural history of the collections of manuscripts which is eagerly awaited, but Israel barely makes a dent (RE, 59-66). We can thus doubt that the Radical Enlightenment was as Spinozist as Israel claims, and that the work of the philosopher of Amsterdam was the only, or at least principal, source of the most virulent religious, social, and political contestation. But the category itself of Spinozism appears problematic. Of course, this is the kind of notion that the history of philosophy is accustomed to using. But can we really make it a historiographical category, and at what price? Indeed, for many authors of the 18th century, the term gathers together an ensemble of notions from diverse heterodox traditions. If the Treatise of the Three Imposters, this Harlequin’s coat of free-thought, could circulate under the title The Spirit of Spinoza, we cannot escape the question which haunts the two volumes, but is never formulated: of what is Spinoza the name? To demonstrate the importance of Spinozism as the matrix of the Radical Enlightenment, Israel begins by defining the Spinoza’s doctrine, starting with an analysis of his work and that of his disciples, to then show everything in the works of different authors in the 18th century which corresponds to it. For all his concern to reduce Spinozist thought to a system of connected notions, constituting a radical rupture in the serene sky of philosophy and thus an intellectual program for all radicals, Israel does not seem to realize that the operation itself of claiming what Spinoza’s doctrine consists of is not at all a neutral historiographic operation, which can remain an objective description, but really an interpretative decision, like the one that was ceaselessly made by his disciples or his adversaries since the 17th century. It would be legitimate, and without doubt stimulating, to construct the category of Spinozism beyond Spinoza’s own work, as a sort of collective production, which would owe as much to disciples, friends, and the first editors of the work, as to the master himself. 44 Again this would have to be done explicitly by precisely studying the dynamics of this intellectual, discursive, and editorial production, in the immediate circles of recognition where the first interpretation of the “philosophy of Spinoza” was elaborated and fixed. Now this is precisely what Israel does not do, since he contents himself with devoting a monographic chapter to some prominent figures of this circle, those whose personal works influenced the intellectual history of the Netherlands. On the other hand, this loose definition of Spinozism has the ultimate consequence of erasing the philosophical specificity of Spinoza’s work, reducing it to the refusal of Cartesian dualism, the disenchantment of the world, and a diversity of egalitarian aspirations. Why, then, make at this point Spinoza the deus ex machina of the Radical Enlightenment, when other authors have emphasized the diversity of radical Dutch thought in the 17th century? 45 Doubtless because this canonical figure in the history of philosophy offers Israel a narrative bargain in the form of “finally Spinoza arrived” which makes up for the profusion of lesser-known authors. But, more profoundly, because the presence itself of the name Spinoza throughout the 18th century, as the figure of atheism, allows him to substantiate the importance of the theoretical revolution produced in Holland. The name of the philosopher of Amsterdam allows the identification of philosophical radicality of the 18th century and that of the Netherlands in the 1660s. There would be however another possible approach which would consist not in sorting out the elements of Spinoza’s thought in the controversies, but studying the way that these controversies produce, invent, and reconfigure Spinozism, and for what purpose. 51 It is indeed very striking to note that the dissemination of Spinozist propositions were largely carried out through refutations, which, sometimes sincerely and sometimes in a more ambiguous manner, cited the author of the Theological-Political Treatise and the Ethics to better establish what appeared to them unacceptable or scandalous in his work. 52 Even authors favorable towards certain aspects of Spinoza’s thought had a relation to it which was not of reverence, but, at best, of critical invention, so much so that the reference to Spinoza necessarily circulated in the mode of controversy, or more exactly of refutation. 53 The question, for example, would be less to know at which point Bayle was authentically Spinozist, in the sense that he sincerely adhered to this or that principle of his philosophy, but rather how the article that he devoted to Spinoza in his Historical Dictionary profoundly defined what Spinozism was for the entire 18th century. Such an approach would then allow us to interrogate this great specificity of Spinozism: why did the majority of radical authors in the 18th century, those who Israel considers “Spinozists,” want absolutely to refute Spinoza? Israel essentially responds: because of prudence, even dissimulation, which is, of course, a plausible answer, in an era when censorship remained formidable. But one could also take seriously the fact that Spinozism, before being a constituted doctrine, was first of all an object of scandal, the symbol of an “atheism made into a system,” according to Bayle’s formulation. Israel is right to say that Spinoza was seen as “the supreme philosophical bogeyman of Early Enlightenment Europe” (RE, 159), but he is wrong to believe that only the authors that he considers conservative or moderate saw Spinoza as a danger. It is more productive to consider that the Radical Enlightenment, even when it borrowed from Spinoza, constructed itself necessarily against him. Thus, the systematic and deductive reasoning of Spinoza is foreign to those whom Paul Vernière called the “neo-Spinozists” and who were sometimes called in the second half of the 18th century “modern Spinozists”: these authors who rethought materialism starting from vitalist medicine, experimental discoveries, and life sciences to make an evolutionist pantheism, Diderot being the preeminent figure. 54 The language nourished by scholasticism, its physics, its will for geometrical demonstration, appeared to them terribly archaic, even when they intend to follow him in the “consequences” of his system. 55 Even in the eyes of the most radical, Spinoza is as much a challenge as an inspiration. Yves Citton has also recently taken up the question of the Spinozism in the 18th century, but starting from a different point of view: he strives to update the literary and philosophical works of the period inspired by Spinozist themes and to draw political and intellectual lessons from them, especially to rethink contemporary theories of freedom. His approach, he claims, is resolutely non-historical: the cultural context, the history of the book, or the biographies of the authors are deliberately excluded from the field of analysis, in favor of a direct encounter with the body of texts. He does not remotely claim to trace the known influence of Spinoza on the authors he studies, but reads their texts parallel to his, “on the lookout for effects of resonance, literal encounters, metaphorical regroupings, weavings of parallel narratives,” and, setting out from here, bringing to light the existence of a Spinozist imaginary, defined in view of recent interpretations of Spinoza. 56 However, historians could take useful lessons from this book, in particular because it shows well that the Spinozism of the 18th century is an elusive object, a menacing specter, that must be thought in terms of invention much more than influence. Far from avoiding the problems posed by the identification of a Spinozist tradition, the methodological liberties taken by Citton with regard to the history of ideas show well that the Spinozism of the 18th century is only meaningful through the interpretive act of the researcher who decides to read these texts as Spinozist, with the measuring rod of his own intellectual agenda. What permits him for example to integrate, in a second circle of “Spinozist” authors that Israel defines as moderate, such as Montesquieu, Voltaire, or Maupertuis, and even, in a provocative fashion, certain defenders of the orthodoxy such as Lamy and Pluquet, who contribute to defining Spinozism by refusing it. Spinozism, in this perspective, is no longer a group of authors united by an intellectual and political coherence and a common battle, but rather the dissemination of an ensemble of themes, formulas, and texts associated with the name of Spinoza. If the historians of clandestine philosophy debate the exact place occupied by Spinozism, the phrase “Radical Enlightenment” itself seems widely accepted, but its weakly problematized usage is weighed down with misunderstandings. My hypothesis is that the success of this term owes a lot to the ambiguity that it maintains on the philosophical or political nature of this radicality. If we look closely, Israel always defines the Radical Enlightenment starting with its philosophical content: radical thinkers are those who defend a set of positions coming from philosophical monism. As he says many times, the Radical Enlightenment is those who draw the most radical conclusions from the thesis of the unity of substance and from the effects of the scientific revolution. But he finds that these conclusions are radical not only in the sense that it would be a matter of pushing the argument to its ultimate consequences, but also in a political sense, where these conclusions are those which most directly oppose the established order in all its domains. Israel does not seem to doubt that the two levels necessarily coincide. From there, two problems arise. On the one hand, this adequation supposes a coherence of radical positions, as if a monist and materialist ontology necessarily implied radical social and political positions: democratic republicanism, equality of the sexes, freedom of expression, anti-colonialism. But this argument rests on a vision of the philosophical field as a continuüm of homogenous positions going from conservatism to radicalism, passing through moderation. This is a very reductive vision which fares poorly against case studies. Israel furthermore has a hard time convincing us that Spinoza himself was a convinced democrat, much less a revolutionary or a feminist. 61 When he gets to the Spinozists of the 18th century, the demonstration turns out to be even more fragile. To take only one example, Boulainvilliers, who was doubtless one of the most authentic commentators on Spinoza, would have difficulty passing for a democratic and revolutionary republican, when he was in fact a partisan of strong aristocratic power against monarchist absolutism. 62 As far as that goes, we have the right to doubt that Spinozism, or radical materialism more generally, was the sole theoretical basis permitting one to conceive and promote, in the 18th century, the rights of women, the emancipation of Jews, or the abolition of slavery. It might be useful to turn towards the numerous methodological discussions in British historiography that have have focused on the usages of the term, notably after the use that was made of it by Marxist historians to trace the continuity of a radical tradition since the Cromwellian revolution until the radicals of the end of the 18th and beginning of the 19th century. 64 The reproaches to this historiography focused principally on two points. Can we use the term radical before its entry into political vocabulary in the 1790s and its success in the 1820s? Must we define radicalism as a coherent political language (notably that of republicanism) or as a functional position (that of the critique of the established order)? Whatever the response, it emphasizes that the usage of the term “radical” more or less explicitly associates two elements: a discourse, founded on a strong critique of the monarchical order and social inequality, and political action, aiming at transforming this order. Now with Israel, it is exactly this line between philosophical radicality, sociopolitical critique, and revolutionary action which is the implicit horizon of the demonstration, but which is never demonstrated. The reification of diverse forms of heterodox thought into the movement of the “Radical Enlightenment” thus authorizes the demonstration. Another way of thinking what could be radical about the production of texts or ideas in the 18th century would be to examine the practical relation of these authors to the established order, that is, their choices of writing and publication. Put otherwise, is one radical when one writes manuscripts that no one will read or which only circulate in very limited circles? This question, raised notably by Pim den Boer regarding Holland of the 17th century, can appear provocative: 65 Could one not be radical in the secrecy of one’s office? It appears to me, however, extremely important for thinking the form of radicality of the Enlightenment, since it stresses the stakes of a public use of philosophy, which at that time took on an unprecedented relevance. One can indeed advance the hypothesis that the true novelty of the Enlightenment, in terms of free-thought, is not doctrinal but consists rather of assuming the public use of heterodox ideas beyond the scholarly space. 66 It is not so much the content of free-thought that is new, but rather the fact of thinking as a struggle, not only an intellectual effort, and therefore of reflecting on the conditions of its publication. By publication, we have to understand at the same time disclosure, in the sense that a discourse reserved for a small élite of strong and free spirits now circulates more widely, and the constitution of a public, which takes form exactly through the new uses of critique. Posing the question of radicalism in these terms allows us to remain to shed a different light the historical importance of the circle of Dutch authors linked to Spinoza in the 1670s. Not that Spinoza himself, who prudently refused to allow his works to be translated into Dutch or for the Ethics to be published in his lifetime, could really be considered a radical from this angle. 67 But, on the other hand, some of his close associates assuredly were, such as the Koerbagh brothers, who paid with their lives for their will to divulge more widely the rationalist critique of the Bible, and who after Spinoza’s death hastened to publish his Opera posthuma in his name (or at least his initials), in a particularly difficult political context. Participating in this project, which was simultaneously an intellectual concern and a reflective sense of provocation, they powerfully contributed to the construction of Spinozist philosophy of a scandal and rekindled the dynamic of public polemics that the Theological-Political Treatise had already stimulated. The radicalism of these Dutch circles, which are often categorized as “Spinozist” and appear to have been active until the beginning of the 18th century, lies perhaps as much in this will to promote the work of Spinoza among broader layers of the population as to a hypothetical philosophical coherence, divided as they were between the deepening of Cartesianism, the interest aroused by Spinoza’s propositions, and the emergence of new scientific practices. In its contemporary usages, the term “radical” is often trapped in a form of anachronism, which projects onto the intellectual space of the 18th century a political representation where one can situate authors as being more or less radical, which implicitly means more or less left-wing, 68 in the name of a homology between philosophical positions and political positions. Hence the use of terms like “avant-garde.” 69 This anachronism is aggravated by the identification of this radicality with a scientistic materialism which is nothing more than one of the forms that political radicality has been able to take for three centuries. But to this uncontrolled anachronism, one could oppose a more controlled practice of anachronism, which explicitly poses the question of what being “radical” could mean at the time of the Enlightenment, once it is established that the term did not exist. It would be necessary then to see in it a form of risk-taking, a manner of investing oneself politically, of assuming a responsibility, of thinking precisely the writing of philosophy as a risk. What is at stake is simultaneously what might be called strategies of writing, but also the very conception of philosophical discourse as the audacity and freedom of speech, as parrhesia: this important notion of ancient thought which designates the irruption of a “truth-telling,” this virtue of a free act of speech which engages the one who makes it in the name of truth and leads to a dramatization of philosophical discourse. 70 From this point of view we could defend Voltaire, an emblematic figure of the moderate Enlightenment in the eyes of Israel, as ultimately more radical than certain of the authors evoked by the latter, in his way of putting into play his philosophical struggle and his call to “crush the infamous.” 71 But the case which is the most interesting on this point is without doubt that of Jean-Jacques Rousseau. Israel is hardly comfortable with Rousseau. In the conclusion of the first volume, he claims that, despite certain moderate elements, his “delegitimizing of the social and political structures of the day” and his republican theory of the general will link up in an evident fashion with the radical philosophical tradition born in the middle of the 17th century (RE, 720). In the second volume, he considers henceforth that Rousseau, initially allied with the radical current, broke with the Enlightenment starting in 1754 to become a “moral prophet” of the anti-Enlightenment (EC, 11), a fairly strange formula which is aligned with the highly debatable book of Graeme Garrard. 72 This discomfort reveals in reality the fairly artificial and in any case not very productive character of this genre of categories, a fortiori when one tries to apply them to an author like Rousseau, whose work is marked by ambiguity and shows, in a dazzling fashion, that radical thought is not a coherent whole. 73 Rousseau’s republicanism and his denunciation of inequality by no means rest on a Spinozist materialism. Is Rousseau radical, moderate, conservative? Posed in doctrinal terms, the question barely has meaning. On the other hand, if we reformulate the question of radicality in relation to the personal engagement of the author, to his way of articulating his personal experience and his work, to the very conception of writing as a public gesture, Rousseau’s specific radicalism appears much more clearly. The libertine authors of the 17th century and the majority of freethinkers of the 18th century practiced all forms of concealment, first of all the use of anonymity or pseudonyms, but also practices of ambiguous writing. 74 Anonymity could be total, even if historians always discuss the attribution of certain clandestine manuscripts. Baron d’Holbach, without doubt the greatest figure of Enlightenment materialism and atheism, never published under his name and, with the exception of a handful of friends, no one in his lifetime knew that he was the author of the System of Nature and his other works. All the same, his stylistic choices, in accordance with an atheist proselytism more persuasive than combative, aimed exactly at downplaying atheism in order to make it into precisely a non-radical position, far from the whole culture of scandal. 75 There also existed more ludic forms of anonymity, such as those favored by Voltaire, master in the art of multiplying pseudonyms and pretending to disavow his own books. On the whole, a certain art of evasion which came at the same time from prudence and distinction was the norm among those who attacked the orthodoxy. Rousseau on the other hand made it a point of honor to sign his books under his own name. It was a matter of both a social statement, affirming writing as a vocation against aristocratic or bourgeois prudence, and a genuine political statement of intellectual and juridical responsibility. 76 There was here a certain defiance that caused him considerable legal troubles, stimulating the severity of the authorities. That Rousseau published the Social Contract and Emile under his own name was at the heart of the scandal caused by their publication, in the eyes of the Archbishop of Paris, the Parliament, but also of Voltaire. After the Social Contract was condemned by the Small Council of Geneva, Rousseau revealed himself, demanding to be judged because he was openly the author. 77 In the quasi-revolutionary context of Geneva in the years 1764-1765, this demand, published in a pamphlet aimed at the authorities of the city, was a position that we can certainly describe as radical. It assumed the author bore political responsibility for the texts that he publishes, and more broadly the indissociable character of the author and the work, affirming that the truth-value of a philosophical utterance was inseparable from the exemplary life of the philosopher. Rousseau summed this up in a strong formula: “If Socrates had died in his bed, one might now wonder whether he was anything more than a skillful sophist.” Such a posture, of course, can tend towards forms of moral exhibitionism, which Rousseau’s adversaries were not afraid to reproach him for, and which led him to turn his isolation and the misunderstandings he elicited into the very subject of his last writings. 78 But it irrefutably contains a form of radicalism, because it is inscribed in a rupture with the best-shared codes of heterodox writing, and because it makes the public use of philosophy into an essential stake of the Enlightenment. What Geography of the Enlightenment? Since its publication, the first volume of Radical Enlightenment has been presented as completely recasting the geography of the Enlightenment, in several ways. First of all, the work speaks strongly against the national interpretations of the Enlightenment in favor of a pan-European approach. This way of breaking overtly with the overestimation of national contexts and of presenting the Enlightenment as a unified movement on the European scale is without a doubt one of the most seductive aspects of the book. Many times Israel shows in effect that the debates circulate throughout Europe, like the case of the oracles from the 1680s (RE, 359-74). All the same, certain biographies of radical authors, in the history of the Enlightenment, highlight the European circulation. Thus Alberto Radicati of Passerano, Piedmontese aristocrat exiled to France then to London, where he publishes and is condemned, then finishes his life in The Hague. For that matter, by studying the margins of Enlightenment Europe, beyond England, France, and Germany, Israel’s efforts contribute in decentering the traditional narrative of Enlightenment. We find in fact pages which deal with Greece, Scandinavia, and Russia. But it is above all in reevaluating the essential role of Holland, Israel’s privileged area of expertise, that Radical Enlightenment seeks to modify the geography of Enlightenment and nuance the tendency of historiography to privilege the Parisian philosophers. This part of the work is undoubtedly its most interesting and least questionable contribution. Yet, with this exception, brought to the forefront by all commentators, the geography of the Enlightenment proposed by Israel is ultimately fairly conventional, barely different from that of Paul Hazard in the 1930s. France and Germany play a great role in it, just as Italy plays a lesser role. Southern and Eastern Europe are confined to a few rapid chapters. The principal surprise is the weak place of the British world, meaning England and Scotland. In large part, Israel’s book can be read as an attack in good standing against the works that, from John Pocock to Roy Porter, highlighted, with nevertheless very different presuppositions, the role of the English Enlightenment. 80 Hence, this blatant underestimation of the role played by Hobbes, the impact of the English Revolutions, the neo-republicanism of Harrington, and religious radicalism. The Scottish Enlightenment receives no better treatment from Israel. Above all, Israel adopts a very homogeneous vision of European space. The Radical Enlightenment is not pluricentric: it is a bloc, whose center is displaced from the Dutch Republic to France after the conservative reaction which touches the Dutch Republic at the beginning of the 18th century. An initial flourishing of radical French authors in the first two decades of the century (d’Argens, Boulainvilliers, Tyssot…) is contested by the moderate reaction associated with Voltaire, but, starting in the 1750s, the reunification of the Enlightenment happens under the guidance of the radical, and in particular by the principal among them, Diderot, around the Encyclopedia. Consequently, in Enlightenment Contested, the majority of authors cited and studied are French authors, some of them certainly little known, others on the contrary perfectly integrated into the philosophical canon. If Spinoza was the hero of the first volume, Bayle is clearly the hero of the second. He is the one whose philosophical and religious radicalism serves, via the Huguenot refuge, as a relay between the Dutch Enlightenment of the 17th and the French Enlightenment of the 18th centuries. Thus, the history of the Radical Enlightenment would be one, we might say, of a transfer of radicality, on the model of the translatio imperii: “the centre of gravity was first located in the Netherlands and later shifted to France” (EC, 27), or again “the main line here transferred from the late seventeenth- and early eighteenth-century Dutch Republic to France, which consequently was the Enlightenment’s true epicentre for most of the eighteenth century” (EC, 864). The key to this astonishing recentering is without doubt, here also, Israel’s desire to establish a direct line between the Radical Enlightenment and the French Revolution. In recasting the intellectual origins of the French Revolution with this genealogical approach, Israel is condemned to retreat from his European geography of the Radical Enlightenment to a specifically French focus. The radical Enlightenment allows thus the forceful return of the myth of French Europe: starting from 1720, Israel writes, “French language and culture eclipsed all the rest as the medium for diffusing radical ideas in Europe and the Atlantic world more generally” (EC, 27). This return to a Francocentric approach is ultimately accompanied with an absence of reflection on the geography of Enlightenment, on the localization of knowledges and their circulation, on the role of the metropoles and the networks of sociability, and on the view that the radical authors themselves had on this geography, all questions currently widely debated but which oblige us to leave the strict domain of the history of ideas. 81 The map of Europe in mind in the first volume is fairly revealing of an approach which is content with localizing the “cultural centers” and the “places of publication” without interrogating the properly spatial dynamics of philosophical knowledges, nor their capacity to transform the very representation of Europe as a historical and cultural entity. Did the authors considered most radical contribute to thinking Europe as the space of the Enlightenment? Instead of categorically rejecting the contributions of studies of national contexts, a more fruitful path would be to pursue together a European approach to the Enlightenment and the recognition of different contexts, in order to study the diverse forms of circulation and reception of the Radical Enlightenment. Indeed, it would be paradoxical for these to escape what is undoubtedly a major phenomenon of the 18th century: the progressive nationalization of cultural fields, that is, at the same time the growing role of national institutions, but also the major temptation for elites to use cultural debates in the framework of national projects. We will take only two examples, both in the Franco-German framework. The reception of Diderot in Germany, well studied, reveals that it was not so much the neo-Spinozist thinker of the Letter on the Blind or D’Alembert’s Dream that were read and known, but much more the author of The Father of the Family and the theorist of theater, adopted as tutelary figure of the construction of a national German theater. 82 Can we study the career of La Mettrie, author of Man a Machine and one of the most influential promoters of radical materialism, without interrogating the cultural politics of Frederick II who welcomed him to Berlin, imposed him on the Prussian Academy and protected him? More generally, the debate between national and European Enlightenments is badly posed since the true challenge is to articulate precisely the circulation of people, texts, and ideas and the reality, difficult to contest, of the increasingly national functioning of intellectual debates. In a pinch, it’s possible to think that the transnational dimension of certain debates studied by Israel, like those already cited on the oracles at the end of the 17th century, is much more a heritage of the tradition of the Republic of Letters of the 16th and 17th centuries than a novelty of the Enlightenment, these characterized rather by an initial autonomization of national cultural fields, due among other things to the progression of publications into vernacular languages, the establishing of scholarly institutions linked to the state, and the emergence of national projects supported at the same time by monarchical states and, sometimes, by their opponents. The Enlightenment is again the object of debate. We can only rejoice that narrowly national interpretations, the classical canons of texts and authors, traditional interpretations, have been questioned. The vitality of the heterodox thought at the turn of the 17th and 18th centuries, the importance of the reference to Spinoza, or again the place of the Dutch Republic in the European geography of the first Enlightenment are henceforth gained. For all that, it is not necessary that the return of the history of ideas, if it must take place, dispense with a reflection on the way it constructs the object of intellectual history. It would be above all regrettable to replace one doxa with another by artificially constructing a homogeneous philosophical tradition and a teleology of philosophical radicalism, linking Spinoza and the French Revolution and, doubtless further, the contemporary radical left. It is not insignificant that the notion of modernity is so central to Israel’s work, figuring not only in the titles of two volumes but also at the heart of the demonstration. The aim is certainly to show that the Spinozism of the Radical Enlightenment is at the foundation of secular, egalitarian, and democratic “modernity” in Europe, to the point that at times the contemporary stakes end up covering the historical discourse. When Israel thus describes one of the essential values of the radical Enlightenment: “personal liberty of lifestyle and sexual conduct between consenting adults, safeguarding the dignity and freedom of the unmarried and homosexuals” (EC, 866), we can doubt that such a formula could come from the pen of a philosopher of the Enlightenment, be he Spinozist or not. But, more broadly, it is the very definition of modernity that poses a problem. Must it really be defined in such reductive terms, as a definitive repudiation of all forms of religiosity, indeed belief, opening the path to the – certainly incomplete – coming of an egalitarian, tolerant, and peaceful society? Such a modernity, sure of itself and the superiority of its rationalist and universalist values, appears already singularly dated. But there are indeed yet other ways of considering the modernity of the Enlightenment, particularly through the relation that philosophy maintains with its historicity, with its own present. One thinks of course of the lesson of Michel Foucault, who defined the Enlightenment not as a step in the long history of humanism, but rather as “a set of events and complex historical processes,” at once institutional, social, technological, and cognitive; and above all as a new relation of philosophy “to the present as a philosophical event to which philosophy belongs,” and thus as the emergence of a new way of posing the question of modernity in the “relation of discourse to its own present reality.” 95 That Foucault’s reflections, based on a commentary on Kant’s “What is Enlightenment,” were presented in a first version to the audience at the Collège de France at the opening of his 1982 course on parrhesia, is intriguing and invites us to study conjointly this reflexivity of the philosophy of the Enlightenment and the social dramaturgy of its forms of expression. The whole question of the radicality of the Enlightenment and its modernity could then be considered in a new light. This is a translation of an article that first appeared in the journal Annales: Antoine Lilti, “Comment écrit-on l’histoire intellectuelle des Lumières? Spinozisme, radicalisme et philosophie,” Annales. Histoire, Sciences Sociales 64, no. 1 (2009): 171-206. 1. ↑ Lumières! Un héritage pour demain, exhibition catalogue, Paris, BNF, 2006; Tzvetan Todorov, In Defence of the Enlightenment, trans. Gila Walker (New York: Atlantic Books, 2009); Régis Debray, Aveuglantes Lumières, journal en clair-obscur (Paris: Gallimard, 2006). 2. ↑ Margaret C. Jacob, The Radical Enlightenment: Pantheists, Freemasons, and Republicans (Metairie: Cornerstone Book Publishers, 2006 ). 3. ↑ Jonathan I. Israel, Radical Enlightenment: Philosophy and the Making of Modernity, 1650-1750 (Oxford: Oxford University Press, 2001). Henceforth cited as RE. 4. ↑ Jonathan I. Israel, Enlightenment Contested: Philosophy, Modernity, and the Emancipation of Man, 1670-1752 (Oxford: Oxford University Press, 2006). Henceforth cited as EC. 5. ↑ “A democratic civilization, avowedly based on equality, needs to know its origins correctly” (EC, 60); “The social values of the Radical Enlightenment, in short, have an absolute quality in terms of reason which places them above any possible alternative” (EC, 869). 6. ↑ For example: “Locke and Hume, like Voltaire and the great American Deist Benjamin Franklin were politically, socially, morally, and in some respects, religiously – and in their views on philosophy’s proper scope – essentially conservative thinkers who opposed many or most of the radical and democratic ideas of their age and, as such, were, in the main, opponents of the Radical Enlightenment” (EC, 58). 7. ↑ Darrin McMahon, “What are Enlightenments?,” Modern Intellectual History, 4.3, (2007), 601-616, 609. 8. ↑ Spinoza’s thought began to become known in a small Dutch circle at the onset of the 1660s, as well as in certain networks of the Republic of Letters, especially through the figure of Henry Oldenburg, who had visited Spinoza in Amsterdam in 1661 and subsequently maintained an ample correspondence. But it is above all the appearance of the Tractatus theologico-politicus in 1670, the scandal it provoked, and its sizable diffusion throughout Europe that provided Spinoza with recognition. On the other hand, the Ethics was only published after his death (coming in 1677) in the Opera posthuma, which also contained unfinished works and letters, and was clandestinely published during the winter of 1677-78. These works were immediately condemned by civil and religious authorities. 10. ↑ Cf. The Early Enlightenment in the Dutch Republic, 1650-1750, ed. Wiep Van Bunge (Leiden: Brill, 2003). 11. ↑ This return to Spinoza doubtless traces back to, on the one hand, the rereadings inspired by Marxist thought in the work of Louis Althusser, and then in the work of Pierre Macherey or Étienne Balibar; and, on the other hand, to the work of Gilles Deleuze. The latter is no doubt crucial for the multiple contemporary reference points of neo-Spinozism. More recently, the Spinozist reference is explicit and important in the works of Antonio Negri and Michael Hardt, Frédéric Lordon, and Christian Lazzeri. For a recent balance-sheet, see Spinoza et les sciences sociales: De la puissance de la multitude à l’économie des affects, ed. Yves Citton and Frédéric Lordon (Paris: Éditions Amsterdam, 2008); Céline Spector, “Le spinozisme politique aujourd’hui: Toni Negri, Étienne Balibar…,” Esprit, May 2007, 27-45. The turn to Spinoza is today one of the major elements of the theoretical arsenal of this anti-authoritarian and alter-globalization intellectual left that can be openly qualified as…radical. 12. ↑ Gilles Deleuze, Spinoza: Practical Philosophy, Paris, trans. Robert Hurley (San Francisco: City Lights, 1986); Antonio Negri, The Savage Anomaly: The Power of Spinoza’s Metaphysics and Politics, trans. Michael Hardt (Minneapolis: University of Minnesota Press, 1991); Michael Hardt and Antonio Negri, Multitude: War and Democracy in the Age of Empire (New York: Penguin, 2004). 13. ↑ Antonio Negri, “Spinoza’s Anti-Modernity,” trans. Charles T. Wolfe, in Subversive Spinoza: (Un)Contemporary Variation, ed. Timothy S. Murphy (Manchester: Manchester University Press, 2004), 79-93; Yves Citton et Frédéric Lordon, “Un devenir spinoziste des sciences sociales,” in Spinoza et les sciences sociales: De la puissance de la multitude à l’économie des affects, 19. 14. ↑ Qu’est-ce que les Lumières « radicales » ? Libertinage, athéisme et spinozisme dans le tournant philosophique de l’âge classique, eds. Catherine Secretan, Tristan Dagron et Laurent Bove (Paris, Éditions Amsterdam, 2007). 15. ↑ Israel’s body of work is considerable. See especially Race, Class and Politics in Colonial Mexico, 1610-1670 (Oxford: Oxford University Press, 1975); Empires and Entrepots: The Dutch, the Spanish Monarchy and the Jews, 1585-1713 (London, The Hambledon Press, 1990); The Dutch Republic: Its Rise, Greatness, and Fall, 1477-1806, (Oxford: Clarendon Press, 1995); Diasporas Within a Diaspora: Jews, Crypto-Jews and the World Maritime Empires (1540-1740) (Leiden/Boston, Brill, 2002). 16. ↑ We might lament precisely this way of treating context (urban development, public space, libraries, the role of censorship, women, or even the press) as a preliminary so as to not have to return to it. On Hazard and Gay, see Paul Hazard Crisis of the European Mind: 1680-1715, trans. J. Lewis May (New York: New York Review of Books, 2013 ); Peter Gay, The Enlightenment: An interpretation, 2 vols. (London, Wildwood House, 1966-1973). 17. ↑ Israel reduces the social history of culture to a simple extension of the history of mentalities, and criticizes it for a structuralist determinism, which he seems to mark as a “legacy of the Annales School.” This obviously fails to take into account the last thirty years of methodological reflections and empirical studies, which have been aided, among others things, by a critique of the notion of mentalities, the developments of histories of the book, reflections on the notion of representations, studies on intellectual sociabilities, or even the history and anthropologies of the sciences. All of these points are blatantly ignored. One should hope that Israel reads 18th century radicals more scrupulously than he does his own colleagues. 18. ↑ Dominick LaCapra, Rethinking Intellectual History: Texts, Contexts, Language (Ithaca: Cornell University Press, 1983); see especially his methodological remarks in History and Reading: Tocqueville, Foucault, French Studies (Toronto: University of Toronto Press, 2000), 21-72. 19. ↑ Franco Venturi, Utopia and Reform in the Enlightenment (Cambridge: Cambridge University Press, 1971), 2. 20. ↑ This ambiguity is particularly prominent in the conclusion to the second volume, which plays on both the historical and philosophical sense of the term, “importance” (EC, 865-66). 21. ↑ One can take the striking example of the Count of Boulainvilliers, to whom Israel devotes an entire chapter and several passages of commentary. While his works on the history of political institutions and the nobility – in which he defends the interests of the nobility – were published and reprinted in his lifetime and found great success, his works inspired by Deism and Spinozism remained more private. His abridged Universal History was only circulated among a small circle of intimate friends and was never published. L’Essai de Metaphysique was only published – clandestinely – after his death. Finally, his translation of the Ethics remained largely unknown until the nineteenth-century, and we are still debating whether it is written by his hand, On this question of the publication and reception of radical works, see Harvey Chisick, “Interpreting the Enlightenment,” The European Legacy, Vol. 13, No. 1 (2008): 35-57. 22. ↑ Israel concludes the second volume by defining the radical Enlightenment as “a package of basic concepts and values” that can be summarized in eight cardinal points: reason as the sole criterion of the true, the rejection of supernatural explanations, racial and sexual equality, a secular and universal ethics, toleration and freedom of thought, acceptance of the liberty of sexual conduct, freedom of public expression, and democratic republicanism (EC, 866). Against the objection that certain authors were radical in some domains but not in others, Israel responds that “it was assuredly not possible to be so coherently” (Ibid.) and that the object of intellectual history is to reconstruct coherent forms of thought. The opposition with sociocultural history is explicit, which is more interested according to him in “peripheral topics, underground associations, and forms of sociability rather than on intellectual arguments and patterns of thought and controversy” (EC, 867). 23. ↑ Paul Vernière, Spinoza et la pensée française avant la Révolution (Paris: PUF, 1954); Disguised and Overt Spinozism Around 1700, ed. Wiep van Bunge and Wim Klever (Leiden: Brill, 1996); Spinoza au XVIIIe siècle, ed. Olivier Bloch (Paris: Méridiens Klincksieck, 1990); Sylvain Zac, Spinoza en Allemagne. Mendelssohn, Lessing et Jacobi (Paris: Méridiens Klincksieck, 1989); David Bell, Spinoza in Germany from 1670 to the Age of Goethe (London: Institute of Germanic Studies, 1984); Winfried Schröder, Spinoza in der deutschen Frühaufklärung (Würzburg: Königshausen und Neumann, 1987). 24. ↑ Silvia Berti, “At the Roots of Unbelief,” Journal of the History of Ideas, Vol. 56, No. 4 (1995): 555-575. 25. ↑ Léo Strauss: art d’écrire, politique, philosophie. La persécution et l’art d’écrire, ed. Laurent Jaffro et al. (Paris: J. Vrin, 2001). 26. ↑ Gianluca Mori, Bayle philosophe, (Paris: H. Champion, 1999), 181. For a nuanced presentation of current debates on Bayle, see also Pierre Bayle dans la République des Lettres: philosophie, religion, critique, ed. Antony McKenna and Gianni Paganini (Paris: H. Champion, 2004). 27. ↑ In the same manner, and an even more surprising fashion, Israel ranks another Neapolitan, Paolo Mattia Doria, with the radical authors, although Doria was a patrician hostile to materialism. The bibliography on these authors is too large to be cited here. We will return to the recent synthesis by John Robertson, The Case for the Enlightenment: Scotland and Naples, 1680-1760 (Cambridge: Cambridge University Press, 2006). In a recent review of The Radical Enlightenment, which is fairly favorable towards Israel’s book, Giuseppe Ricuperati, undoubtedly the top specialist of Italian Enlightenment radicalism, expresses strong reservations on the presence of Doria and Vico as radical authors: Giuseppe Ricuperati, “In margine al Radical Enlightenment di Jonathan I. Israel,” Rivista storica italiana, Vol. 115, No. 1 (2003): 285-329. 28. ↑ Gustave Lanson, “Questions diverses sur l’histoire de l’esprit philosophique en France avant 1750,” Revue d’histoire littéraire de la France, XIX (1912): 1-29 and 293- 317; Ira O. Wade, Clandestine Organization and Diffusion of Philosophic Ideas in France from 1700 to 1750 (Princeton: Princeton University Press, 1938). 29. ↑ Two collective works are the starting point for this rediscovery, Ricerche su letteratura libertina et letteratura clandestina nel Seicento, ed. Tullio Gregory et al. (Florence: La Nuova Italia, 1981); and Le matérialisme du XVIIIe siècle et la littérature clandestine, op. cit. Since 1992, an annual journal, La lettre clandestine, has presented work on these topics. The bibliography is considerable. See in particular, besides the titles cited in other notes, Miguel Benitez, La face cachée des lumières: recherches sur les manuscrits philosophiques clandestins de l’âge classique (Paris/Oxford: Universitas/The Voltaire Foundation, 1996); Geneviève Artigasmenant, Du secret des clandestins à la propagande voltairienne (Paris: H. Champion, 2001); Alan C. Kors, Atheism in France, 1650-1729, Volume 1: The Orthodox Sources of Disbelief (Princeton: Princeton University Press, 1990); Scepticisme, clandestinité et libre-pensée, eds. Gianni Paganini, Miguel Benitez et James Dybikowski (Paris: H. Champion, 2002). For a complete annotated bibliography, see Jean-Pierre Cavaillé, “Libertinage, irréligion, incroyance, athéisme dans l’Europe de la première modernité (XVIe-XVIIe siècles). Une approche critique des tendances actuelles de la recherché (1998-2002),” Les Dossiers du Grihl (2007). 30. ↑ Gianni Paganini, “Avant la promenade du sceptique: Pyrrhonisme et clandestinité de Bayle à Diderot,” in Scepticisme, clandestinité et libre-pensée, 17-46. 31. ↑ See for example Tristan Dagron, “Néo-spinozisme ou antispinozisme: le cas Toland,” in Qu’est-ce que les Lumières « radicales » ?. Libertinage, athéisme et spinozisme dans le tournant philosophique de l’âge classique, 325-41. 32. ↑ Ann Thomson, Bodies of Thought: Science, Religion, and the Soul in the Early Enlightenment (Oxford: Oxford University Press, 2008). 33. ↑ Martin Mulsow, Enlightenment Underground: Radical Germany, 1680-1720, trans. H.C. Erik Midelfort (Charlottesville, VA: University of Virginia Press, 2015); Schröder, Spinoza in der deutschen Frühaufklärung. 34. ↑ See especially Heterodoxy, Spinozism and Free Thought in Early-Eighteenth-Century Europe: Studies on the Traité des trois imposteurs, eds. Sylvia Berti, Françoise Charles-Daubert, and Richard Popkin (Dordrecht/Boston: Kluwer Academic Publishers, 1996); Le Traité des trois imposteurs et L’Esprit de Spinosa: philosophie clandestine entre 1678 et 1768, ed. Françoise Charles-Daubert (Oxford: Voltaire Foundation, 1999). 35. ↑ We owe Margaret Jacob for discovering the Knights of Jubilation (The Radical Enlightenment: Pantheists, Freemasons and Republicans). The nature and function of their meetings remain topics of debate: for an dissenting opinion, see Christiane Berkvens-Stevelinck, “Les Chevaliers de la Jubilation: maçonnerie ou libertinage? A propos de quelques publications de Margaret C. Jacob,” Quaerendo, Vol. 13, No. 1 (1983): 50-73, and Vol. 13, No. 2 (1983): 124-148. 36. ↑ One finds the same kind of philosophical syncretism in another important text of this tradition, the Symbolum sapientae, whose diffusion was important in clandestine German milieus at the beginning of the 18th century, and which Gianni Paganini characterizes as an alliance of libertine thought and Spinozism as revised by the Kabalists, but drawing on it in a resolutely skeptical direction. See Gianni Paganini, Les philosophies clandestines à l’âge classique (Paris: PUF, 2005), 79-94. 37. ↑ Jacob, The Radical Enlightenment: Pantheists, Freemasons and Republicans. 38. ↑ Similarly, the treatment of the famous Memoir of the Thoughts and Feelings of Jean Meslier, by the French priest of the same name and which so marked the anti-religious thought of the Enlightenment, is quite curious. While it is listed as number four in the table presenting the major clandestine philosophical manuscripts of the Early Enlightenment (RE, 690), Israel does not discuss it at all. It is true that Meslier had not read Spinoza, whom he only knew through the refutation of Father Tournemine. In the second volume, however, Meslier is promoted to “the most coherently and systematically radical thinker of the French early Enlightenment” (EC, 716 and 724-28) on the basis of his atheism, but his relation to Spinoza is hardly elucidated. On the other hand, we know that Voltaire first published Meslier’s text, in a version that was certainly redacted. The intellectual and publishing genealogies are thus infinitely more complex than the author suggests. 40. ↑ Martin Mulsow, Enlightenment Underground: Radical Germany, 1680-1720, Chapter 4. 41. ↑ This is a point emphasized by Martin Mulsow in an unpublished text, “The Radical Enlightenment: Problems and perspectives.” I thank him for having sent it to me. 42. ↑ Van den Enden in fact participated in the 1674 Rohan conspiracy against Louis XIV, which led him straight to the gallows. Can we really say that Van den Enden “had plotted to overthrow [Louis XIV’s] monarchy with philosophy” (RE, 183) when he participated (in the context of a war between France and Holland) in an aristocratic plot which is located in the memory of the Fronde? See Anette Smedley-Weill, “Un conspirateur au temps de Louis XIV: le chevalier de Rohan,” in L’État classique. Regards sur la pensée politique de la France dans le second XVIIe siècle, ed. Henry Méchoulan and Joël Cornette (Paris: J. Vrin, 1996), 373-85. 43. ↑ Pierre-François Moreau, “Spinoza était-il spinoziste?,” in Qu’est-ce que les Lumières « radicales »? Libertinage, athéisme et spinozisme dans le tournant philosophique de l’âge classique, 289-97. 44. ↑ The study of the “Spinoza circle” traces back to Koenraad O. Meinsma’s classic text, Spinoza et son cercle: Étude critique historique sur les hétérodoxes hollandais (Paris: J. Vrin,  1983), which broke with the image of a solitary and reclusive Spinoza in order to show his place in an intellectual milieu. 45. ↑ Wiep Van Bunge, From Stevin to Spinoza: An Essay on Philosophy in the Seventeenth-Century Dutch Republic, (Leiden/Boston: Brill, 2001). 46. ↑ This reinvention of Spinoza at the end of the 18th century was at the center of the Pantheism controversy. Mendelssohn, defending Lessing who Jacobi accused of being a Spinozist, proposed a revised Spinozism, compatible with natural religion. See Pierre-Henri Tavoillot, Le crépuscule des Lumières: Les documents « de la querelle » du Panthéisme (1780- 1789) (Paris: Éditions du Cerf, 1995). Israel says a few works about the Pantheismusstreit controversy in “The Early Dutch Enlightenment as a Factor in the Wider European Enlightenment,” in The Early Enlightenment in the Dutch Republic, 1650-1750, 215-230. But curiously, he sees it as the legitimation of Spinoza and Spinozism by the major German thinkers of the end of the 18th century (Lessing, Mendelssohn, Goethe…) and thus as a confirmation of his analysis of the influence of the Radical Enlightenment; the crucial aspect, however, is the invention of a very different Spinozism than that of the beginning of the 18th century. 47. ↑ Pierre Macherey, Avec Spinoza: Études sur la doctrine et l’histoire du spinozisme (Paris: PUF, 1992), 7. 48. ↑ RE, 199, among other places. This ongoing recourse to the testimony of the anti-Enlightenment is not surprising; the glorification of a radical tradition, adorned with all the virtues of a critique of the established order, and the denunciation of a blasphemous subversion are only two sides of the same intellectual operation. 49. ↑ For a clarification of the stakes of the analysis of controversies as applied to intellectual history, see especially Jean-Louis Fabiani, “Controverses scientifiques, controverses philosophiques: Figures, positions, trajets,” Enquête No. 5 (1997): 11-34; Christophe Prochasson and Anne Rasmussen (eds. ), “Comment on se dispute: Les formes de la controverse,” Mil neuf cent: revue d’histoire intellectuelle, No. 25 (2007). 50. ↑ Israel emphasizes “the Enlightenment’s essential duality, that is the internal struggle between the opposing tendencies which from beginning to end always fundamentally divided it into irreconcilably opposed intellectual blocs.” (EC, X). 51. ↑ For an excellent recent example showing how this simultaneously political, social, and religious controversy reconfigured the category of the “libertine,” see Stéphane Van Damme, L’épreuve libertine: Morale, soupçon et pouvoirs dans la France baroque (Paris: Éditions du CNRS, 2008). A more transversal approach, which is still very attentive to the intellectual effects of controversies and the way in which categories are constructed, can be found in Darrin M. McMahon, Enemies of the Enlightenment: The French Counter-Enlightenment and the Making of Modernity, (New York/Oxford: Oxford University Press, 2001). 52. ↑ See the refutation written by René-Joseph de Tournemine’s, published as the preface to François Fénelon’s The Existence of God in 1713, or Christopher Wittich’s Anti-Spinoza, published in Amsterdam in 1690. 53. ↑ In fact, Spinoza and his work represent a very specific configuration, whereby there are not really controversies in the strict sense, since no one explicitly or publicly argues from a Spinozist point of view. It is therefore a matter of controversies by default, where capillary Spinozist themes produce effects without claimed spokespersons or polemical engagements, or thus by being grafted onto other controversies. 54. ↑ Vernière, Spinoza et la pensée française avant la Révolution, 528-611. On Diderot, Vernière is more nuanced than Israel, and correctly notes that it is unrealistic to wish to lay down a definitive interpretation of this “rhetorician capable of mirroring all arguments” (555). 56. ↑ Yves Citton, L’envers de la liberté: L’invention d’un imaginaire spinoziste dans la France des Lumières, (Paris: Éditions Amsterdam, 2006), 27. 58. ↑ According to Tournemine’s formulation, cited by Citton, L’envers de la liberté, 46. 59. ↑ Johannes Colerus, The Life of Benedict de Spinosa (The Hague: M. Nijhoff, 1906 ). On the importance of biographical writing in the history of Enlightenment-era philosophy, see Dinah Ribard, Raconter, vivre, penser: Histoire(s) de philosophies, 1650-1766 (Paris: Vrin/Éditions de l’EHESS, 2002), especially 127-32 on the anecdotes relating to Spinoza. 60. ↑ Macherey, Avec Spinoza, 19. 61. ↑ Here again I refer to the suggestive remarks of Pierre-François Moreau, “Spinoza était-il spinoziste?.” More broadly, the question of Spinoza’s thought is extremely complicated, as the Theological-Political Treatise and the Political Treatise can be interpreted in divergent ways. It is thus perfectly possible, against analyses of Spinoza as the subversive prophet of the multitudes and radical democracy, to highlight the aporias of his theory of democracy, as shaped by the “fear of the masses” and the tensions of democratic institutionalization. See Etienne Balibar, Spinoza and Politics, trans. Warren Montag (New York: Verso, 1998), and “Spinoza, the Anti-Orwell: The Fear of the Masses, in Masses, Classes, Ideas, trans. James Swenson (New York: Routledge, 1994), 1-38. 62. ↑ François Furet and Mona Ozouf, “Two Historical Legitimations of Eighteenth-Century French Society: Mably and Boulainvilliers,”in François Furet, In the Workshop of History, trans. Jonathan Mandelbaum, (Chicago/London: University of Chicago Press, 1984), 125-39; Diego Venturino, Le ragioni della tradizione: nobiltà e mondo moderno in Boulainvilliers, 1658-1722 (Florence: Le Lettere, 1993); Michel Foucault, Society Must Be Defended: Lectures at the Collège de France, 1975-1976, ed. Mauro Bertani and Alessandro Fontana, under the direction of Francois Ewald, Alessandro Fontana, and Arnold I. Davidson, trans. David Macey (New York: Picador, 2003), 115-88. 63. ↑ When the political translation of this philosophical radicalism is elaborated, it is done in a way that is at once clear and unclear [ferme et floue]. For example, after a discussion of natural equality in Spinoza’s thought, and its incorporation in the thought of Lahontan, Radicati, and Rousseau, Israel abruptly concludes: “When in the depths of the French Revolution the Jacobin clubs all over France regularly deployed Rousseau when demanding radical reforms, and especially anything – such as land redistribution – designed to enhance equality, they were at the same time, albeit mostly unconsciously, invoking a radical tradition which reached back to the late seventeenth century” (RE, 274). Almost every term here poses a problem: from the existence of a “radical tradition” originating with Spinoza, to its “unconscious” influence on Jacobin militancy and the peasant movements (which are in any case not the same). 64. ↑ For a recent development of these debates, English Radicalism, 1550-1850, ed. Glenn Burgess and Matthew Festenstein (Cambridge: Cambridge University Press, 2007). 65. ↑ Pim den Boer, “Le dictionnaire libertin d’Adriaen Koerbagh,” in Qu’est-ce que les Lumières « radicales »? Libertinage, athéisme et spinozisme dans le tournant philosophique de l’âge classique, 104-30. 66. ↑ Jean-Pierre Cavaillé, “Libertinage ou Lumières radicales,” in Qu’est-ce que les Lumières « radicales »? Libertinage, athéisme et spinozisme dans le tournant philosophique de l’âge classique, 61-74. 67. ↑ This is a difficult question. A combination of prudence and elitism led Spinoza to use his writings in a limited fashion, and at times he deployed a double language which some commentators have attributed to the Marrano tradition: Yirmyahu Yovel, Spinoza and Other Heretics, Volume 1: The Marrano Tradition (Princeton: Princeton University Press, 1992). However, we cannot overlook the fact that Spinoza never hesitated to publicly state his break with the Law of Moses, which forced his excommunication from the Jewish community in Amsterdam in 1656; that he published the Theological-Political Treatise, a manifesto for the freedom of expression; and that he made several attempts at one point to publish the Ethics. 68. ↑ And not always implicitly: Israel writes that radical authors rebelled “so to speak from the ‘left’” (EC, 43). 69. ↑ “By the mid 1740s, the radical faction, despite the opposing efforts of Voltaire, had largely captured the main bloc of the French intellectual avant-garde which it continued to dominate down to the time of Napoleon” (EC, 12). 70. ↑ Michel Foucault, The Government of Self and Others: Lectures at the Collège de France, 1982-1983, ed. Frédéric Gros, under the direction of François Ewald, Alessandro Fontana and Arnold I. Davidson, trans. Graham Burchell (New York: Palgrave Macmillan, 2010). 71. ↑ We will note in passing that Israel is particularly harsh on Voltaire, whom he presents as being a moderate, even conservative, providentialist deist. We can readily agree that Voltaire is not a revolutionary in many senses, for example in social or political terms. But in regard to religion, his critique of miracles and scripture made him a difficult author for the ecclesiastic authorities to accept. Moreover, as Margaret Jacob has argued, the Newtonianism vulgarized in France and even the rest of Europe, was largely de-Christianized, compared to its English variant. More broadly, the category of the “moderate Enlightenment” is hardly more consistent than that of the Radical Enlightenment: in the same way, it confuses that which derives from a philosophical moderation and that which corresponds to a political moderation, without saying a word about a theory of moderation, as one finds it in Montesquieu’s work, for example – a theory that is far from a mere reaction to radical audacity, but instead hinges on a theory of history and power. 72. ↑ Graeme Garrard, Rousseau’s Counter-Enlightenment: A Republican Critique of the Philosophes (Albany: State University of New York Press, 2003). 73. ↑ On the link between this ambiguity and the uses of Rousseau during the French Revolution, see James Swenson, On Jean-Jacques Rousseau: Considered as One of the First Authors of the Revolution (Stanford: Stanford University Press, 2000). 75. ↑ Alain Sandrier, Le style philosophique du baron d’Holbach: conditions et contraintes du prosélytisme athée en France dans la seconde moitié du XVIIIe siècle (Paris: H. Champion, 2004). 76. ↑ Christopher Kelly, Rousseau as Author: Consecrating One’s Life to the Truth (Chicago: University of Chicago Press, 2005). 77. ↑ Jean-Jacques Rousseau, “Letters Written from the Mountain,” trans. Christopher Kelly, in The Collected Writings of Jean-Jacques Rousseau, Vol. 9, ed. Christopher Kelly and Eve Grace (Lebanon, NH: Dartmouth College Press, 2013), 131-61. 78. ↑ Antoine Lilti, “The Writing of Paranoia: Jean-Jacques Rousseau and the Paradoxes of Celebrity,” Representations 103 (2008): 53-83. 79. ↑ When Rousseau seeks to denounce the persecution he views himself to be a victim of because of his writings, he contrasts his own treatment with that of the “Atheist Spinoza,” who “peacefully taught his doctrine” and “lived and died in tranquillity, and even well respected.” See “Letter to Beaumont,” trans. Judith R. Bush and Christopher Kelly, Collected Writings, Vol. 9, 24. 80. ↑ Roy Porter, The Enlightenment: Britain and the Creation of the Modern World, (London: Penguin, 2000); J.G.A. Pocock, Barbarism and Religion, Volume One: The Enlightenments of Edward Gibbon, (Cambridge: Cambridge University Press, 1999). 81. ↑ Charles W. J. Withers, Placing the Enlightenment: Thinking Geographically About the Age of Reason, (Chicago: University of Chicago Press, 2007). 82. ↑ Anne Saada, Inventer Diderot: les constructions d’un auteur dans l’Allemagne des Lumières, (Paris: Éditions du CNRS, 2003). 83. ↑ See Wiep van Bunge’s remarks in his introduction to The Early Enlightenment in the Dutch Republic, 1650-1750, 1016. 84. ↑ Denis Diderot, Voyage en Hollande, cited in Wijnand Mijnhardt, “The Construction of Silence: Religious and Political Radicalism in Dutch History,” in The Early Enlightenment in the Dutch Republic, 1650-1750, 233. 85. ↑ Mijnhardt, “The Construction of Silence: Religious and Political Radicalism in Dutch History”; see also Margaret C. Jacob and Wijnand Mijnhardt (ed. ), The Dutch Republic in the Eighteenth Century: Decline, Enlightenment and Revolution (Ithaca, Cornell University Press, 1992). 86. ↑ Including, for example, the very rapid dissemination of the juridical and constitutional arguments of the Neapolitan jurist Gaetano Filangieri, a theorist of the rights of man and natural right, in the Hispano-American world: Antonio Trampus (ed. ), Diritti e costituzione. L’opera di Gaetano Filangieri e la sua fortuna europea (Bologna: Il Mulino, 2005). 87. ↑ See for example Jorge Cañizares-Esguerra, How to Write the History of the New World: Histories, Epistemologies, and Identities in the Eighteenth-Century Atlantic World (Stanford: Stanford University Press, 2001), which brings to light the existence of a properly creole dynamic of critical reflection on the sources of the Ameroindian past, a “patriotic epistemology” that could recast our understanding of the geography of the Enlightenment and European intellectual controversies. 88. ↑ While Bayle’s “partly veiled” thinking on the colonial question is interpreted in an anti-imperial sense, Montesquieu’s thinking on slavery is judged in light of the paradoxical use made of it by colonists in Saint-Domingue to provide justification for slavery. (EC, 605-6). For a more nuanced approach to Montesquieu’s complex position, see Jean Ehrard, “Audace théorique, prudence pratique: Montesquieu et l’esclavage colonial,” in Abolir l’esclavage: Un réformisme à l’épreuve (France, Portugal, Suisse, XVIIIe-XIXe siècles), ed. Olivier Pétré-Grenouilleau (Rennes: PUR, 2008), 27-39. 89. ↑ Sankar Muthu, Enlightenment Against Empire (Princeton: Princeton University Press, 2003). 90. ↑ Larry Wolff and Marco Cipolloni (ed. ), The Anthropology of the Enlightenment (Stanford: Stanford University Press, 2007). 91. ↑ Robertson, The Case for the Enlightenment: Scotland and Naples, 1680-1760. 92. ↑ Jean-Claude Perrot, Une histoire intellectuelle de l’économie politique, XVIIe-XVIIIe siècle (Paris: Éditions de L’EHESS, 1992). Conversely, we can remark that Israel does not discuss political economy at all. 93. ↑ J. G. A. Pocock, Barbarism and Religion, 4 vols. (Cambridge: Cambridge University Press, 1999-2005); see also his “Historiography and Enlightenment: A view of Their History,” Modern Intellectual History 5, no. 1 (2008): 83-96. 94. ↑ In recent years, many other fields or sites of intellectual history have been opened, showing the complexity of the linkages between the Enlightenment and modernity, whatever our definition is of the former, and which seek to interpret the “polysemic Enlightenment” in all its diversity and historicity: Michel Porret, “Introduction,” in Sens des Lumières, ed. Michel Porret (Chêne-Bourg: Georg, 2007), 15. The history of science has especially broken with the grand narrative of the inexorable progress of scientific rationality in order to emphasize contradictions and contemporary stakes. See in particular the panorama offered in William Clark, Jan Golinksi, and Simon Schaffer (eds. ), The Sciences in Enlightened Europe (Chicago: University of Chicago Press, 1999). 95. ↑ Michel Foucault, “What is Enlightenment?,” trans. Catherine Porter, in The Foucault Reader, ed. Paul Rabinow (New York, Pantheon Books, 1984), 32-50; also The Government of Self and Others, 13-14. See also the dossier “Foucault et les Lumières,” Lumières 8 (2006). Antoine Lilti teaches social and cultural history at the École des Hautes Etudes en Sciences Sociales in Paris and is former editor of the Annales journal. He is the author of The World of the Salons: Sociability and Worldliness in Eighteenth-Century Paris, and co-editor of Penser l'Europe au XVIIIe siècle: commerce, civilisation, empire.